I was going to post a recipe I came up with over Christmas for gluten free sugar cookies, but first I want to tell you a little about gluten free flours. While you can recreate the taste of wheat flour baked goods, you generally cannot recreate the texture. I’ve had pretty good success with cookies and baked goods so far, but I have yet to create a bread or pizza crust that tastes just like the real deal. Bob’s Red Mill has some pretty good mixes, for those people who are kitchen impaired. King Arthur aslo has a pretty good bread mix too. But, they are kind of expensive. The up-side to them is that if you’re only baking for yourself, it’s probably worth it to not have to buy a bunch of different flours that take up a lot of room in your fridge. Udi’s makes some pretty good gluten free products, but I really prefer my own baking becuase they taste closer to the regular thing (like breads and bagels). Udi’s also has a really tasty frozen gluten free pizza. All of the premade stuff is expensive, but if you’re only doing it for yourself, it’s not a total budget killer. The best way to get a good taste out of gluten free flours is to use a mixture of flours. Because I only bake for my daughter and I, I keep my flours in the fridge because they keep longer that way. I live in a small town, but I have been able to find flours at our local Honest Weight Co-Op, in the nature section of our local grocery store (Hanaford, for those of you that live on the east coast), and at a lot type store called Ocean State Job Lots (again, for those of you who live on the east coast). 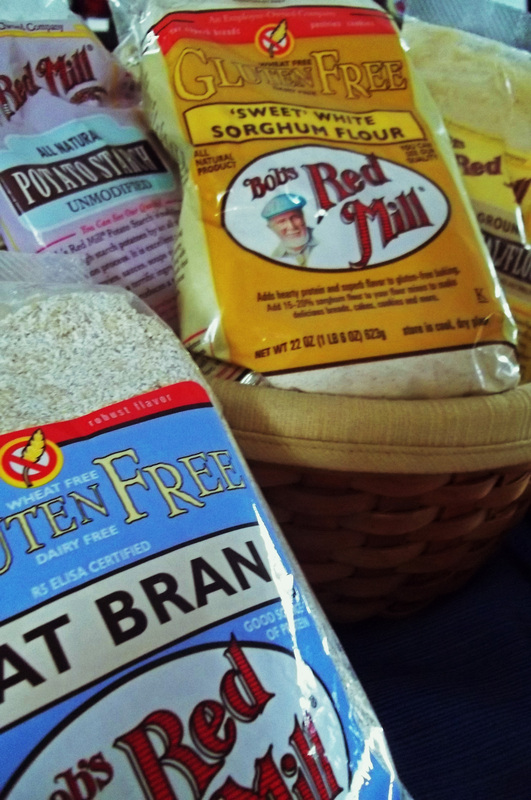 At first I tried Bob’s Red Mill all purpose flour. With some xanthan gum added to it, it does make a good substitution for all purpose flour in recipes. Plus, it tells on the bag how much xanthan gum to use in different kinds of recipes. The taste of BRM AP flour is okay. It definitely has a distinctive taste. It’s a good place to start to start playing with gluten free baking. When I first started making my own flour mixtures, I just bought every gluten free flour I could find and started mixing them together. Through trial and error, I found that my favorite flour mixture for cookies uses a mix of coconut flour, sorghum flour, brown rice flour, almond flour (also called almond meal). I add some potato starch and tapioca starch to give the flour fluffiness when it bakes. The starches also help the dough to react a little like regular dough when baked. 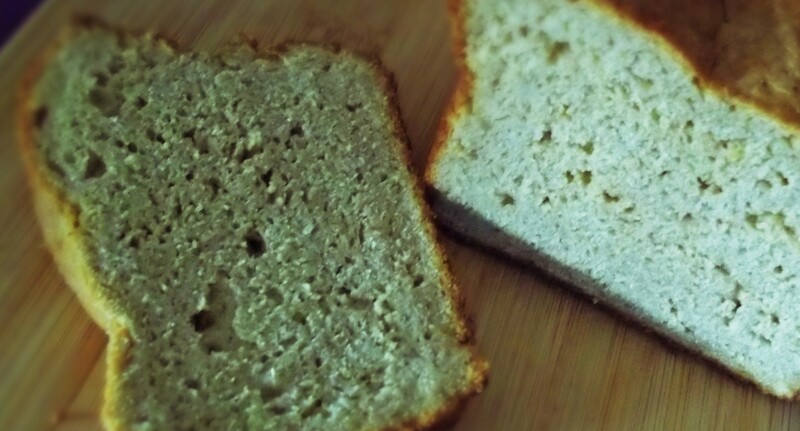 For bread, I’ve found that I like to use a mixture of brown rice flour, teff flour, sorghum flour, and sometimes I add in oat flour, flax meal, and garbanzo bean flour. I’ll post recipes along the way as I find what I like to do. In any of my recipes, you can always substitute all purpose flour for the amount of flours and starches in the recipe (it just won’t taste exactly the same). When baking gluten free, a lot of websites will tell you to measure out everything by weight. I’m not that finicky. I tend to go by the way the dough looks. If the dough is stiff and looks anything like regular dough, it’s not right. I used to love making wheat bread. I made it so much that I knew by looking at it if it had the right amount of flour in the dough. I’m getting to that point now with gluten free baking, but the dough has to look more like cookie dough. If it looks like wheat dough, the bread will come out very dense and crumbly. Protein is important when making gluten free baked goods. I’m fairly dairy free (I occasionally use butter in my baked goods, or something like that), so I generally use coconut milk in baking. It has a nice thick consistency and reacts much like regular milk in baking. Coconut milk doesn’t have as much protein as cow’s milk, so I like to use eggs in my baked goods. For those of you that are egg free or vegan, you can use flax meal soaked in water to replace eggs. I’ve never done that yet, but I’ll give it a try sometime and see how it works. I think that’s all I can think of to tell you about gluten free baking right now. This is mostly stuff I’ve learned through trial and error and through a lot of reading. As I post recipes, I’ll try to post some helpful hints and tips about gluten free baking and gluten free eating in general. Post any questions you have and I’ll make sure to answer them. This entry was posted in Gluten Free Baking, Gluten Free Food. Bookmark the permalink.